The NuSTAR (Nuclear Spectroscopic Telescope Array) launched last week, with a mission goal of studying black holes and their jets of energy, as well as other high-energy objects in our universe (supernovae, compact stars after their explosive deaths, and clusters of galaxies). This is done through using a very unique observatory to study X-ray light. Since NuSTAR focuses X-rays, it requires a long focal length, so the optics must be far away from each other (to achieve a 10 meter focal length). This is done via a unique detector system, optics, and deployable mast, shown in the figure below. As we were watching for updates on the launch of the NuSTAR satellite, I discovered a pleasant surprise. I am a scientist at Goddard in the Astrophysics Science Division (Code 665 to those of you familiar with the code system at GSFC), however, I spend the bulk majority of my time in The Optics Lab here at Goddard Space Flight Center, running my experimental tests of dust grain analogs on equipments that the engineers in the Optics Branch (Code 551) use to test the transmission and reflection properties of different materials. 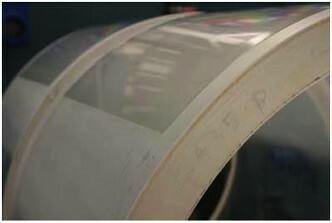 This ranges from coating for new mirrors, to the transmission properties of just about any material you can think of. The head of my lab, Manuel Quijada, is a can-do-it-all guru of materials, and has allowed me to help out on samples that are not necessarily part of my scientific work, but are great for training and very cool to observe unique optical properties with. He informed me that the NuSTAR mirrors were heated at Goddard in another lab, and then sent here, to our lab, for cutting and polishing, as well as testing to ensure the best mirrors were used for the NuSTAR spacecraft. 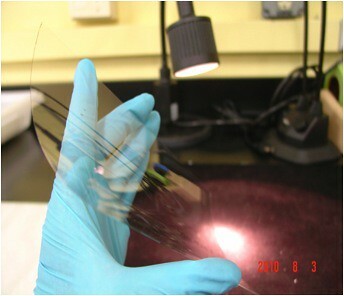 This work was done by a co-op in the Optics Branch, Javier Del Hoyo, who is still here in the lab today. 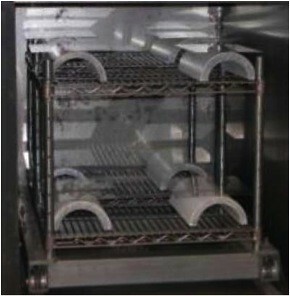 The mirrors, with their unique curvature required for measurements (see the figures below), underwent multiple inspections and testing to ensure they were top quality, then were shipped to Danish Technical University-Space in Copenhagen to be coated with a material suitable for measurements at X-ray wavelengths (Pt/SiC and W/SiC), and then sent to Columbia University, where the precision assemblage of the optics occurred. One of the greatest things about NASA and working in space sciences/engineering is the teamwork aspect of our projects. While the great scientists and engineers at JPL/Caltech led the NuSTAR project, several other NASA centers, universities, and corporations had a hand in allowing this successfully launched mission to come about. This included UC-Berkeley’s Focal Plane Team and Mission Operations Team, Orbital Sciences Corporation’s Spacecraft Team, ATK-Goleta’s Mast Team, Copenhagen and Columbia’s Optics Teams, Sonoma State’s Education and Public Outreach Team, and Goddard’s Optics Team (including the lab I currently call home). In my eyes, that’s pretty awesome. 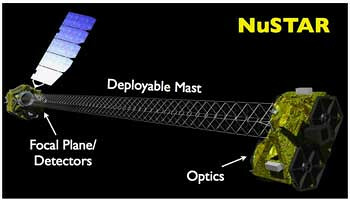 For more information on the teams that worked on NuSTAR, check out: the list on the NuSTAR site).